Peripheral artery disease affects up to 12% of the U.S. population, but is often under-diagnosed and inadequately treated. A lack of vascular medicine training programs, a paucity of resources and poor awareness of the efficacy of simple treatments all contribute. Yet, according to experts, 95% of cases can and should be managed in the primary care setting. “In medically based residency programs in internal medicine or family practice, there is virtually nothing taught about vascular disease outside of the heart,” said Jeffrey W. Olin, DO, professor of medicine and director of vascular medicine at Mount Sinai School of Medicine in New York. PAD decreases quality of life because of pain, limited mobility and increased risk of stroke and myocardial infarction. It also significantly increases the risk of dying from coronary heart disease and other thrombotic systemic events. All-cause mortality is about three times greater and cardiovascular disease mortality is almost six times greater in patients with PAD than in patients without the condition, and the risk of these events is just as great even if patients have no symptoms of claudication, according to epidemiologic studies referenced in the performance measures. PAD is a major manifestation of systemic atherosclerosis, said William R. Hiatt, FACP, professor of medicine in the division of cardiology at the University of Colorado School of Medicine in Aurora, Colo. It is more common than heart failure and in many ways looks and behaves like atherosclerosis in the coronaries, carotids and other vascular territories. PAD occurs in 29% of patients over the age of 70 or in patients between 50 to 69 years old who have diabetes or a past history of smoking. From a symptomatic point of view, patients often present with muscle fatigue, discomfort, or frank pain in their leg muscle when they walk. But while about 50% of patients with PAD have no symptoms, as many as 30% to 40% have atypical leg pain or pain at rest. A small fraction (fewer than 5%) suffer ischemic ulcers or gangrene. Some of these symptoms may seem typical of other problems, particularly among elderly patients or patients with other conditions. Yet leg discomfort from claudication is at least as informative of cardiovascular risk as angina, and critical limb ischemia more dangerous than most cases of ACS or myocardial infarction. For this reason, a vascular review of symptoms was included as a key feature of the American College of Cardiology/American Heart Association 2006 guidelines on PAD. A ratio of 0.90 or less on the ABI indicates PAD. According to the 2010 performance measures, the sensitivity of the ABI is 79% to 95%, and its specificity is 95% to 100%. An ABI of 0.90 or less is associated with twice the 10-year total mortality, cardiovascular mortality and major coronary event rate than the overall rate in each category of the Framingham Risk Score. The performance measures recommend that anyone caring for patients with cardiovascular disease should provide access to the ABI as a diagnostic test for PAD in individuals over age 70 and in those between ages 50 and 69 if they have ever smoked or if they have diabetes. If a patient has symptoms that suggest claudication and the ABI is normal, an exercise ABI study (or other vascular laboratory studies) should be performed to determine if in fact that patient does have PAD. Reimbursement issues currently serve as a major public health barrier to the achievement of this early diagnosis goal, said Alan T. Hirsch, MD, director of the vascular medicine program in the cardiovascular division at the University of Minnesota Medical School and School of Public Health in Minneapolis. “As for any common disease with very high short-term event rates, for which proven treatments would lower morbidity, mortality, and cost, there has been a longstanding national consensus that it is illogical to wait for major symptoms to supervene before the disease is recognized,” said Dr. Hirsch, who is one of the authors of the original 2006 guideline and the new 2010 performance measures. Because PAD is a clear indication of very high short-term cardiovascular risk, medication to lower cholesterol is at the top of the list for treatment, as well as control of hypertension and diabetes. According to the 2010 performance measures, a PAD treatment program should include cholesterol lowering, smoking cessation and antiplatelet therapy. Treatment with a statin is recommended for all patients with PAD who have an elevated LDL (>100 mg/dL). The treatment goal is an LDL level below 100 mg/dL, and a goal of below 70 mg/dL is reasonable. Smoking cessation can include behavior modification therapy, nicotine replacement therapy, bupropion or varenicline. Although smoking cessation is a clearly defined major treatment goal for persons with known heart attack or stroke, past care pathways did not emphasize its equal primacy for PAD. This is key, as no other risk factor is as important to increasing PAD progression, event rates, amputation and cost. In a study published in the Journal of the American College of Cardiology, Dr. Hirsch and his colleagues found that participation in an intensive smoking cessation program was effective and was associated with a major increase in confirmed smoking abstinence in patients with PAD. Participants in the intensive program received a combination of education about the link between smoking and PAD, cognitive-behavioral counseling to develop a plan to quit smoking, and information about pharmacologic treatments. Additionally, all participants selected a person in their social networks who agreed to support them in their efforts to stop smoking. At the six-month follow-up, 21.3% of the patients in the intensive program had stopped smoking, compared with 6.8% in the minimal intervention (“usual care”) group, who had only received verbal advice to quit smoking and a list of smoking cessation programs and resources in their community. The study intervention was identical to that proposed in the PAD performance measures. Clopidogrel or aspirin can be recommended for PAD. However, a meta-analysis published in the Journal of the American Medical Association last year has questioned aspirin's efficacy. This analysis found that aspirin therapy alone (or in combination with dipyridamole) resulted in a statistically nonsignificant decrease in overall cardiovascular events. Dr. Hiatt, a co-author on the meta analysis, recommends aspirin for the PAD patient with other clinical evidence of cardiovascular disease but clopidogrel in those without such a history. Most experts also support use of cilostazol to help improve exercise performance in the patient with claudication. Participation in a supervised exercise program is the least expensive and most effective of any intervention for PAD. Dr. Beyth agreed with the value of a supervised exercise program, but she noted a problem for many internists: a lack of resources and referral options. Although PAD can generally be diagnosed and treated by an internist or primary care physician, there are certain indications for referral to a vascular specialist. A referral is needed if a patient has iliac artery disease, which is identified by hip, thigh or buttock claudication and reduced femoral pulses on exam. That finding means that the disease is up inside the pelvis and abdomen and that the patient would benefit from a stenting procedure, Dr. Olin said. Patients who have the disease from the groin down can be identified by claudication in the calf as well as normal femoral pulses and abnormal popliteal or dorsalis pedis or posterior tibial pulses. According to Dr. Olin, patients with these symptoms who don't respond to maximal medical therapy should undergo imaging by CT angiography, MR angiography, or duplex ultrasound, and they should be referred to a vascular specialist for possible revascularization. According to Dr. Hirsch, 95% of PAD care can be offered in a motivated internist's office where risk reduction, symptom treatment and avoidance of critical limb ischemia can be achieved. For those internists motivated to provide lifelong care, a vascular specialist is needed only when revascularization is considered. Hirsch AT, Haskal ZJ, Hertzer NR, et al. ACC/AHA guidelines for the management of patients with peripheral arterial disease (lower extremity, renal, mesenteric, and abdominal aortic): a report of the American College of Cardiology/American Heart Association Task Force on Practice Guidelines (Writing Committee to Develop Guidelines for the Management of Patients with Peripheral Arterial Disease [Lower Extremity, Renal, Mesenteric, and Abdominal Aortic]). Circulation. 2006;113:1474-1547. Olin JW, Allie DE, Belkin M, et al. ACCF/AHA/ACR/SCAI/SIR/SVM/SVN/SVS 2010 performance measures for adults with peripheral artery disease. J Am Coll Cardiol. 2010;56:2147-2181. Berger JS, Krantz MJ, Kittelson JM, Hiatt WR. Aspirin for the prevention of cardiovascular events in patients with peripheral artery disease. JAMA. 2009;301:1909-1919. Hennrikus D, Joseph AM, Lando HA, et al. Effectiveness of a smoking cessation program for peripheral artery disease patients: a randomized controlled trial. J Am Coll Cardiol. 2010;56:2105-2112. Norgren L, Hiatt WR, Dormandy JA, et al. Inter-society consensus for the management of peripheral arterial disease (TASC II). J Vasc Surg.2007;45(Suppl S):S5-67. Attendees of Internal Medicine 2011 can practice the ankle-brachial index on site at the Waxman Clinical Skills Center. Workshop participants will learn tips on wrapping cuffs, finding the arteries with the Doppler probe, testing accuracy, and interpreting test results. 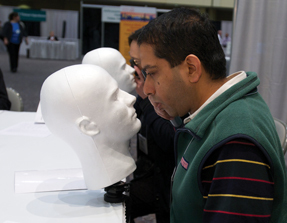 The Clinical Skills Center is located in Hall A of the San Diego Convention Center and is open from 8:00 a.m. to 5:00 p.m. during the meeting. Sessions are free but require registration.